Love your blog, it’s my regular go-to! I am the male CEO of an organization that has no other male staff. I find increasingly that staff and board members are going to a female Vice President for advice and to disclose information that really should be coming to me. I have a good working relationship with my Vice President so no issue there. I am told this occurs because “women find it easier to share with other women”. I’m not sure how to address this without being sexist! Would love to hear your thoughts and advice. Thanks for your kind words. It’s a privilege to be of service. Your question is awesome. We are so afraid of saying the wrong thing when bringing up these concerns that sometimes we prefer silence. I know you didn’t write about diversity, but I thought I would begin there. 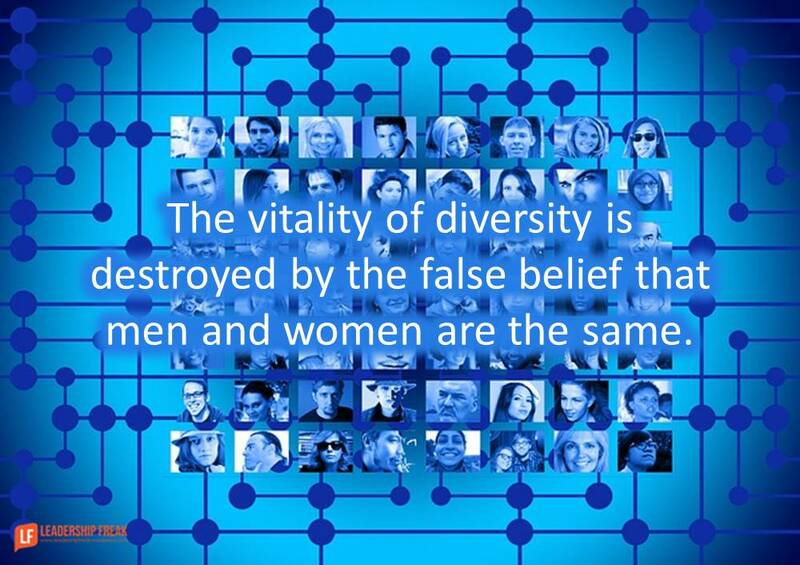 The vitality of diversity is destroyed by the false belief that men and women are the same. Women and men are different from each other right down to the way our brains and bodies function, never mind the obvious anatomical differences. The vibrancy of diversity is found in difference, not sameness. Respect for diversity is best expressed in honoring and leveraging difference, not in propagating the myth of sameness. Frankly, when leaders learn to honor diversity, they also learn how to celebrate strengths in everyone on the team, regardless of gender. We must treat each other as equals, even as we celebrate difference. Look outside your organization for female mentors. Women leaders often navigate the challenges of being in the minority. Additionally, look for a male counterpart who is in a similar situation. Go to your VP for mentoring on how to be approachable. Acknowledge that many people feel a natural discomfort with authority. It feels safer to go to a person with less authority. Adopt strategies to mitigate this challenge. However, it never disappears completely. The word “increasingly” in your email concerns me. You wrote, “I find increasingly that staff and board members are going to a female Vice President for advice …” What has changed? Does your VP aspire to the CEO role? What if your concern has more to do with you and less to do with leading women? Take the bull by the horns. Go to them. Don’t wait for them to come to you. Schedule brief update meetings with board members and key team members. Why isn’t your VP directing people to come to you? Develop proactive strategies with your VP that answer her resistance to directing people to you. The strategies might be things she says. They might be behaviors you adopt. But I have a nagging concern. If your VP resists directing people to you, your relationship with her isn’t as good as you think. Don’t trust her to help you. Don’t look to her for mentoring. Work around her. Strengthen your coaching leadership style. The heart of coaching is trusting connection. Stay curious when you meet with staff and board members. Make fewer statements. Ask forward-facing questions. Include questions about the person as well as the project. “What’s important to you about this?” is one of my favorites. Let go the need to design perfect solutions. Ask, “What imperfect step might we take to make this situation better.” Watch out for reverse delegation where teammates expect you to do things that they should do. What suggestions do you have for ‘The Only Male’? P.S. 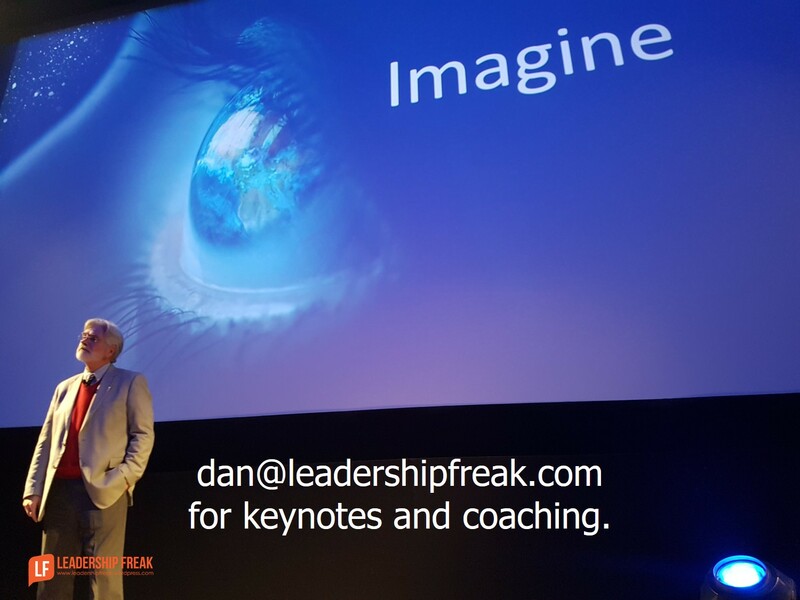 – If you’re new to Leadership Freak, I relax my 300 word limit on Solution Saturday. I have been in a similar situation for 15 years…of the 50 workers that I lead, 47 are female. At one point I had a VP who was tremendous. While many of the employees went to her with issues of concern, I noticed that many more concerns seemed to arise than before she was hired. Once she retired I realized that it wasn’t that there were more issues, simply that they weren’t being addressed due to the fact that many of the female employees didn’t feel comfortable coming to me. Dan is correct, women and men are different. With men it’s more about the ego, with women it’s more about emotion and being heard. Once I began to subscribe to leadership freak, about 5 years ago, this became crystal clear. I started asking more questions about their thoughts and feelings concerning a situation before creating solutions together. I have a much stronger connection with all of them now and it has made all the difference in the world. Thanks alfilippone. Thanks for your story and for your kind words. It’s great that curiosity and question asking worked well for you. My experience indicates that if we want to connect with people, we need to be curious about them. Women are likely to come to other women *first*. They may be discussing an issue as practice, to get their thoughts and concerns in order. As CEO, don’t expect to be the first stop, but you should expect to be the last. The VP should be bringing the speakers to you, but she may be keeping your desk clear by handling things herself. This can be a sign of respect for you and her own confidence. Speak with her assuming positive motives an her part. Make clear what issues are her responsibility, and which ones she should bring to you before solving. Once you two are clear on roles, expect her to help you clarify your roles with staff. Ask her for insights as to why the staff doesn’t come to you. Most likely, the staff find the current situation effective, so they have no incentive to change habits. Thanks Kelly. Your insights are helpful. It’s pretty easy to discern if people are going to the VP to get clear. They end up bringing the issues to the CEO, if they haven’t found a resolution. Your observation that the CEO won’t be the first stop, but should expect to be the last seems very relevant. Transparency, candor, and trust between the VP and the CEO seem indispensable. I am so glad this has been addressed. However I think your principles would apply in any power play situation, no matter the sexes involved. Connection & relationship build a safe platform for transparency, & the walk abouts are a great start. They could seem tokenistic doing them every day after a while, so perhaps introduce by invitation staff forums, inviting 3 or 4. Thanks Margaret. Your comment reminds me of the broad application of leadership principles. I was focused on gender issues while writing this. But you are correct, the ideas apply more broadly. Even finding mentors has broad application. In this case it’s customized to the situation. That’s something you would do in any situation. The idea of staff forums sounds useful. I can think of some powerful stories where leaders listened and took action based on a public meetings. It goes a long way to improve morale, create connection, and establish focus. As a woman, I agree that the VP should direct any and all significant concerns to the CEO without listening to them privately. Sounds like a manipulative woman who may even be fabricating some of the stories brought to her to power-play. If she goes to CEO with “so and so said”, get “So-and-so” immediately and verify the facts. If the VP is saying “This was brought to me confidentially and I don’t want to betray confidences…” MALARKEY!! The VP most likely would love to be CEO and thoroughly enjoys acting in his stead. That seems pretty evident here. Interesting dialogue. My experience in the healthcare environment, which is heavily populated with women in the workforce, required me to embrace a management practice referred to a MBWA or Management By Walking Around. This was suggested by Dan in his first response. I was also reminded of a mindset I encourage my Executive Leadership clients to gain perspective as to the role the truly have. The mindset tool is taking something like Maslow’s Hierarchy of Needs, transitioning it into a Leadership model and inverting it with the leader at the apex but upside down. Through this inverted pyramid and the leader or CEO looking up at their range of responsibility to SERVE. The operations and structure of the organization begins to look differently. To keep this model working, it could be fueled by the CEO or Leader becoming more integrated in all that are looking up to and soliciting feedback from the workers working more closely with the clients, customers and products. A relationship begins that creates two way exchanges and empowers those below the CEO to feel more valued in the workspace. For the CEO, there needs to be a common bond between all parties involved. If the VP is handling everything and never gets to CEO surely functions may work for the staff but the system is failing some place in the hierarchy, the VP needs to confide in the CEO. Some questions I have is the company moral good? Is there dissenters amongst the staff? Is the CEO confident is his employees? Is everyone respectful of each other? Perhaps the VP has things under control allow CEO to address more important issues! Having been in a similar situation a number of years ago; the “Concerns” section of your response resonated the most. While the relationship with the VP role was seemingly good and healthy, it was later evident as preparation for a mutiny! Creating a better relationship and being approachable rather than aloof with those outside the VP bubble is likely the best advice. I really liked how you defined diversity, ‘Respect for diversity is best expressed in honoring and leveraging difference, not in propagating the myth of sameness.’ My company recently underwent forced diversity, and the reasoning was obviously for political show. Those who were promoted simply had to conform to ‘yes men’. Their differences were not, are not harnessed to make a stronger organization. I truly believe diversity is a natural order and I take pride in a diverse workforce that can succeed. Excellent analysis and suggestions, Dan.